The Occupy Movement is inspiring to many of us who long awaited a new dynamic into our dysfunctional culture. It is a powerful cultural force, engaging citizens to promote substantive change to an unfair system. It has already reshaped political conversations with its focus on the corporate elitism and government collusion that has led to a system that profits the 1% instead of the citizenry at large. The Occupy Movement has also shown us that we don't need to be perfectly organized or to have perfect messaging to have an effect. We just need to be active citizens, to raise our voices and use our feet to have effect. Democracy is not a spectator sport. Of course "The Trouble With Occupy' depends on the context. A police officer with orders to pepper spray or remove peaceful protesters may find it troublesome. Politicians are certainly finding trouble in having to address the financial imbalance of the 1% vs. the 99%. Financial institutions like Goldman Sachs, Morgan Chase and Wells Fargo are certain finding trouble with Occupy as the movement applies pressure to the status quo through a number of actions. But that's not what this article is about. To begin, Occupy starts with an us versus them mindset, the 99% against the 1%. This is curious in that we clearly want a cultural system based on inclusiveness, diversity and an appreciation of the reality that we are all here together in this moment. The core problem is not the 1%, being our brothers and sisters, the problem is they best represent the corruption rampant in the current operating system. I do not imagine even the 1% waking each day thinking on how they can destroy human rights, wreck the planet and further undermine prosperity and democracy for the rest of us. They are ingrained with elitism, and hence need to learn something better. Occupy fails to make this clear. Second, The Occupy Movement makes a great deal of noise about what it is against, perfectly understandable when the existing order is so utterly corrupt and dysfunctional. And yet again there is a lack of clarity. Are we opposed to the corrupting influence of money in our political system? Yes. How do we remedy this? Ask 10 Occupiers and you'll get 10 different answers. Implicit in OWS is that we want honestly and integrity, stronger local communities and a healthier ecosystem for Planet Earth. We want abundance and prosperity. We want an end to war, to be treated like the citizens we are instead of being deemed "consumers' by business and government. We want a cultural operating system based on peace and love, not the corruptive power of money. And yet Occupy has not defined any of this in a cohesive manner. Another trouble with Occupy is its finicky relationship with words. Terms like "leader' are eschewed, as an early document described the movement as "leaderless.' Of course leaders are not inherently bad, it's just that bad leaders are prolific in a broken system such as we have today. And of course Occupy is anything but leaderless, yet resistance to ideas like leadership have hampered our organizational efforts. The great irony, of course, is that while terms like "leader' may be scorned within the movement, the term "Occupy' itself is loaded with negative connotations. If one resides in Palestine, Afghanistan or Iraq, I do not imagine "Occupy Palestine' sounds very promising. Being "Occupied' is not considered a good thing in nation-state dynamics, especially if it's been your reality for any number of years. Another irony is referring ourselves as "the 99%.' But of course few of our 300 million Americans are active with Occupy. It's more like the 1% of elites against the 1% of citizen activists, with 98% of Americans somewhere in the middle. Or perhaps it's more accurate to say they're "nowhere in the middle' because they lack the will to be active citizens. There are other troubles as well. People lose energy, burn out and step back. General Assemblies can be tedious and unproductive. Infiltrators make efforts to sabotage us. Our organization is minimal and diffuse. These issues, however, are more easily addressed if we find our footing, so to speak, with the troubles mentioned above. Now here's something interesting. There's a term that exists that describes this new cultural operating system that we seek. A term that acknowledges our inherent unity and the imperative to heal our broken system. A term that supports community and the need for a just and fair system. A term that stands for abundance over greed. A term that demands an end to war and suggests the template for creating a cultural system based on peace and love. This term is World 5.0. I'm well familiar with it as founder of the idea and author of the book, "World 5.0 - Healing Ourselves, Our Earth and Our Life Together." For seven years I've been noodling, gnawing and meditating on this fine idea, and I see how it suits perfectly with all that Occupy and so many other movements and interests are about these days. As someone remarked at the CoreChange Summit [held in Cincinnati] last weekend, "It's the Convergence!" as though that term explains all this emerging energy and all these emerging groups and this new emerging idea of World 5.0. An yet as one studies what is, and what is going on, in our world and culture today, it's easy to see the blatant corporatism, the clueless Republican presidential field, the instability of our financial underpinnings, Global Warming, the great disparities between rich and poor, and on and on - very depressing stuff. At the same time, however, we see unprecedented efforts toward building community, restoring the Earth and unprecedented growth in non-profits and charities. We see a burgeoning movement toward organic, local food production and sustainable energy systems. 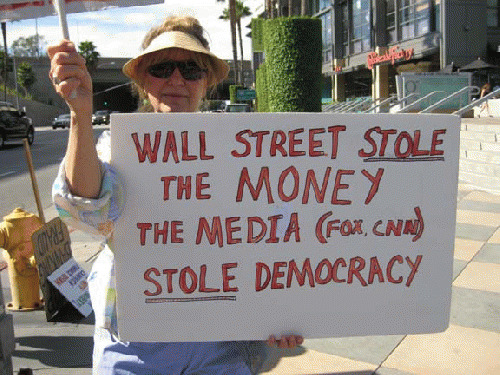 We see a great effort to restore our democracy, spearheaded by The Occupy Movement. The old system is crumbling under the weight of its own corruption, as Occupy, The Arab Spring, the ongoing financial crisis and a host of other factors and influences come to a head here, in 2012. We must admit these are no ordinary times. Calling it "The Convergence" seems an appropriate term, in light of all these wild goings on. And The Convergence has a name - World 5.0. Sorry Bernie, No Hillary - We Are Revolutionaries!